full color printed Art book, e-book and DVD. Purchase both the hardcover, or paperback at Amazon! This 8.5 x 11, 434 page full color art book is a stunning collaboration of contemporary visionary art and mystical writings from an assortment of spiritual traditions. 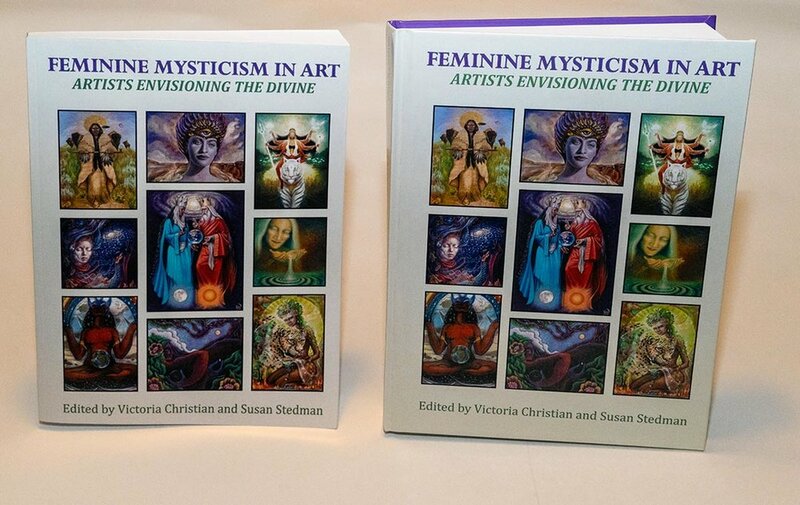 After twelve years of hard work, Feminine Mysticism in Art: Artists Envisioning the Divine has evolved into an epic collaborative effort--one that has the potential to go down in history as a "must have" book for art lovers and mystics from an assortment of disciplines. 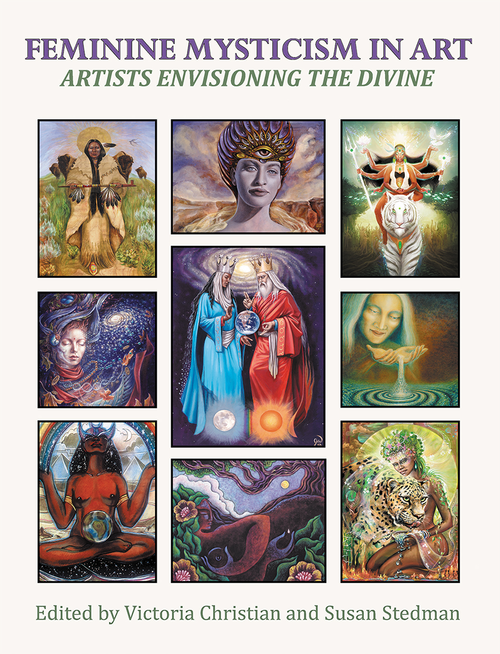 The book includes over 65 contemporary visionary artists. The artwork alone is unique, exquisite, political and provocative, communicating a message of hope for the postmodern era. In addition, the diversity of writings by experts in women's spirituality, mysticism, ecofeminism, transcendental art and transpersonal psychology provide a conceptual foundation for the images. Purchase the Kindle Edition e-Book on Amazon! The mission of the book is to not only document a genre of art referred to as feminine mysticism, or Goddess Art, but also to reveal powerful images of the divine in his/her myriad forms. The ultimate mission of the book is to assist humanity in evolving our conceptualization of the divine, transcending out of antagonistic, dualistic and hierarchical gender associations and into a new mode of consciousness that is more inclusive of all of God's creation. In order for this to occur, however, it is essential that the sacred feminine be firmly rooted in human consciousness. Since the masculine side of God has been so heavily portrayed in Western culture, a large number of people are yearning for images of the Goddess in order to provide alternatives to the conventional dominance of men in religion and society. In contrast, the Goddesses show us that the female can also be symbolic of all that is creative and powerful in the universe as well as provide us with an orientation that can help us save the planet from ecological destruction. Feminine mysticism is a spiritual movement devoted to the re-enchantment of the feminine principle or feminine side of God. Feminine mysticism is a spiritual journey for women, as well as for men, which has been lost to many Westerners but is beginning to resurface in various ways. In the past thirty years, scholars from various disciplines have documented the ancient cultures and religions of the Goddess and the ways in which they had been intentionally subjugated by the patriarchal religions of Judaism, Christianity and Islam. Archeological, mythological and historical evidence all reveal that for thousands of years, matriarchal religions and patriarchal societies existed simultaneously, and that over time, matriarchal or “pagan” religions suffered under centuries of persecution and suppression by the patriarchal societies which held male deities as supreme. As a result, the feminine side of God has been hidden from view, leading to a deconstructed perception of humanity and disrespect towards many attributes associated with the feminine. Although the reign of matriarchal societies is long gone, the time of union between the masculine and feminine principles are close at hand. The Goddess is revealing herself to the human psyche in an assortment of ways, from the arts to the sciences. Her re-emergence is crucial to our society’s shift into a new paradigm, a symbiotic union between the masculine and feminine aspects within the human psyche, society and the world of spirit. However, before this shift in consciousness can occur, the awakening of the Divine Goddess needs to occur on a worldwide level, which is why it is crucial to get as many images of the divine feminine as possible into the public’s view at this time. Since we are on the verge of a major breakthrough in the evolution of human consciousness, people thirst for an understanding of the nature of the Divine Mother – a compelling reason to purchase this book. The shift in consciousness has begun, and you are being invited to assist in this awesome transformation.